We've long been a big fan - and contributor - to the very excellent Flickr group called Vélocouture. The group guidelines make it clear what separates this group from so many other bike groups on Flickr. "Vélocouture is not bicycle fashion. 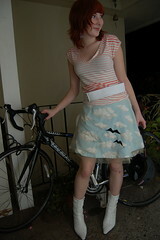 Vélocouture is fashion, on a bicycle. 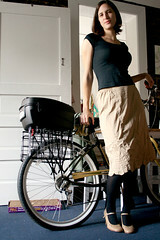 Smart, stylish, functional outfits worn by transportational bicyclists. Celebrate the creative re-purposing of "normal" clothes for use as a transportational cyclist. Help popularize the innovative, functional and fashionable garments that are (finally!) being created by pedal-powered fashion-forward folks around the world. This isn't about wearing costumes or bizarre outfits while on a bike. Plenty of places for that. This is about stylishly carrying oneself through the everyday -- on a bicycle. Also, please note that this group is about fashionable cyclists, not fashionable bicycles. No bike-only shots. Again, plenty of groups exist for photos of your bike." The group features photos of both women and men and, in our opinion, it's one of the beacons of hope for normalising urban cycling and removing the bane of lycra from the streets of cool cities around the world.